Isn't blogland an amazing place? I just love Frugal Fridays! The amount of talent out there in our little corner of cyberspace is inspiring!! The Painted Hive shared an adorable vintage stool makeover. You know I just can't resist furniture with numbers on it. 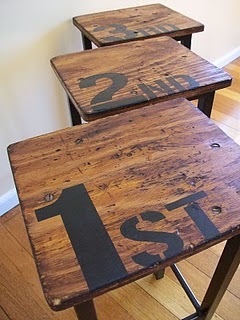 These stools are so cute! I loved this table makeover from Primitive and Proper! So graphic and fun...and the colors are perfect!! A new use for painter's drop cloths....a painted canvas rug. This clever idea was shared by Less Than Perfect Life of Bliss. 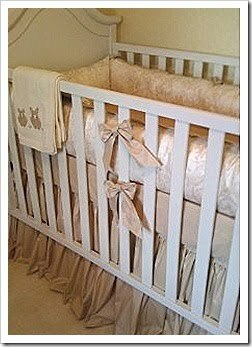 Design Life shared a pretty nursery done on a budget. And this is just the tip of the iceberg, folks! If you haven't had a chance yet, scroll down and check out the other wonderful frugal projects and finds! I too love those stools! SO many creative people out there in blogland!! wendy- thanks so much for featuring my table! i really appreciate it. i also am in love with kristine's stools! they are perfect! and i love the idea for a dropcloth as a rug and am going to try that in my own home! thanks for hosting and the opportunity to gather so many great ideas in one place! They are all so great!!!! Girly- you always have the best linky parties!! I have to agree on the table.....I love it too. Oh wow! I can't believe I was featured on such an awesome blog! Thanks so much!!! I love Cassie's stenciled table and that painted rug too. Thanks so much for hosting Frugal Fridays. There are always so many great projects to sift through.